The Reverend Canon Witold Mroziewski was born on March 25, 1966, to Waclawa Jablonska and the late Jan Edmund Mroziewski in Augustow, Poland. He earned a Masters in Theology from the Catholic University in Lublin, Poland, in 1991. He returned to K.U.L., Poland, and earned a Masters in Canon Law (2001) and Juris Canon Lawyer (Doctoral 2003). Bishop Juliusz Paetz ordained Father Mroziewski a priest at the Cathedral of Lomza on June 29, 1991. He served as a Parochial Vicar in the parish of Kadzidlo. In 1992, he was sent for pastoral service in Brooklyn to minister to Polish expatriates. He served as Parochial Vicar of Our Lady of Czestochowa-Saint Casimir (1993-2000) and served as Pastor of this parish from (2000-2013). 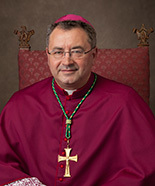 He now serves as Pastor of Holy Cross Parish (2013-present). He is also Associate Promoter of Justice for Criminal Cases and the Defender of the Bond on the Diocesan Tribunal. Reacting to the news of his appointment, Bishop-elect Mroziewski said, “I was told by the Apostolic Nuncio that I was appointed by His Holiness Pope Francis an auxiliary bishop to the Diocese of Brooklyn. At that time, I was shocked to the point of not saying anything. Soon, it came to my senses and my conscience what grace and honor I had received. First of all, I give my humble thanks to His Holiness Pope Francis for selecting me and including me in the College of Bishops. My gratitude goes out to our diocesan bishop, Most Reverend Nicholas DiMarzio, for his trust in me, and his great example of dedication to apostolic service. Thank you to all the bishops of our diocese, to our wonderful priests, religious and laity for their warm welcome given to me over twenty years ago when I came to continue my pastoral duties as a priest. Because of their constant openness, sincere collaboration, spiritual support and great gift of fraternity, this place became my home. I would like to offer everything I received from God with my service to Bishop DiMarzio and to all my brothers and sisters in Brooklyn and Queens as well as the Universal Church,” said Bishop-elect Mroziewski.